Unusual, unique, offbeat music with no commercial potential guaranteed to inspire or inflame. A collection of vanity pressings, demos, song-poem albums, exploitation albums, samplers, gospel / religious albums, specialty albums, souvenir records, childrenâ€™s records, night club / lounge act albums, organ music, motion picture soundtracks, and any other odd stuff we dig up. Enjoy! 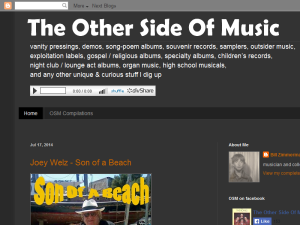 This what your The Other Side Of Music Blog Ad will look like to visitors! Of course you will want to use keywords and ad targeting to get the most out of your ad campaign! So purchase an ad space today before there all gone! If you are the owner of The Other Side Of Music, or someone who enjoys this blog why not upgrade it to a Featured Listing or Permanent Listing?